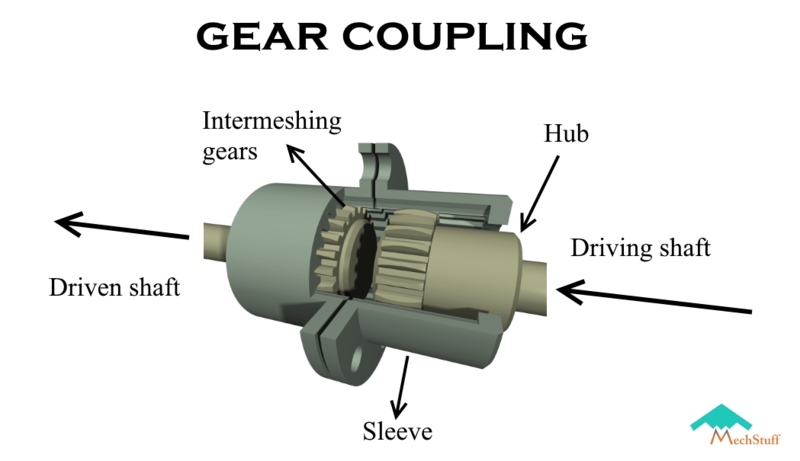 Couplings – the name itself suggests that it couples something(not lovers 😛 ). You might have an idea or two about couplings but today here in this article, we will know about them in detail. We will be discussing what are couplings, what are the types of couplings & their applications. So let’s begin. In simple words, couplings are mechanical devices used to transmit power/torque from one shaft to another shaft. Why do we need couplings? Power can be transmitted by means of various gear arrangements or drives only if the shafts are parallel. Couplings are used when the shafts are in a straight line and are to be connected end to end to transmit power. To transmit power from driver shaft to driven shaft. To connect or couple 2 components which are manufactured separately eg. output motor shaft and generator. To introduce an extra flexibility while transmitting power in case of space restrictions. To introduce protection against overloads. 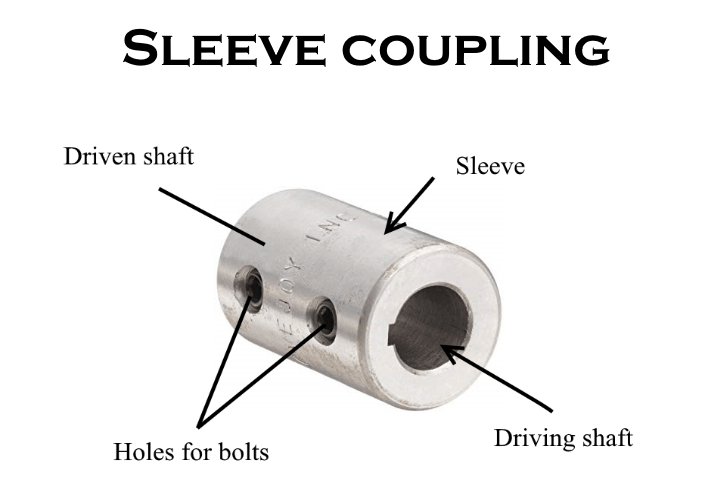 To reduce the transmission of shock loads from one shaft to another by using flexible couplings. Sleeve couplings are nothing but just sort of thick hollow cylinder/pipe called as sleeve or muff. The sleeve is manufactured keeping the diameter of shaft in mind so that the shaft fits perfectly into the sleeve. The driver & driven, both the shafts are then inserted into each side of the sleeve. Also two or more threaded holes are provided into the sleeve as well as in both of the shaft’s end so that they don’t move in longitudnal direction when the bolts are inserted into them. Also the keyway and key ensures that the shaft and sleeve doesn’t slip. The sleeve coupling is easy to manufacture as there are neither more nor more number of parts. They are used where the shafts don’t require any alignments and load capacity is light to medium duty. Split muff coupling with parts labelled. In split muff coupling, the sleeve or muff isn’t a single different part instead it is split into 2. The muffs are semi-cylindrical in shape which then fits over the shaft. Threaded holes are provided on the muffs so that both the shafts can be joined with steel bolts or studs. The special feature of this coupling is that it can be assembled and disassembled without changing the position of shaft. They are used for medium to heavy duty load with moderate speed. Flange coupling is also an easy to manufacture coupling and is similar to sleeve coupling. Here, there are flanges on either side of the 2 sleeves. Both the flanges consist of equal number of threaded holes for bolting purpose. The flanges are then joined together with bolts and nuts. A key section is also provided on the hub and shafts so that there is no slipping condition. A tapered key is used here. This ensures that the hub doesn’t loosen up or move backward and stays attached to the shafts. 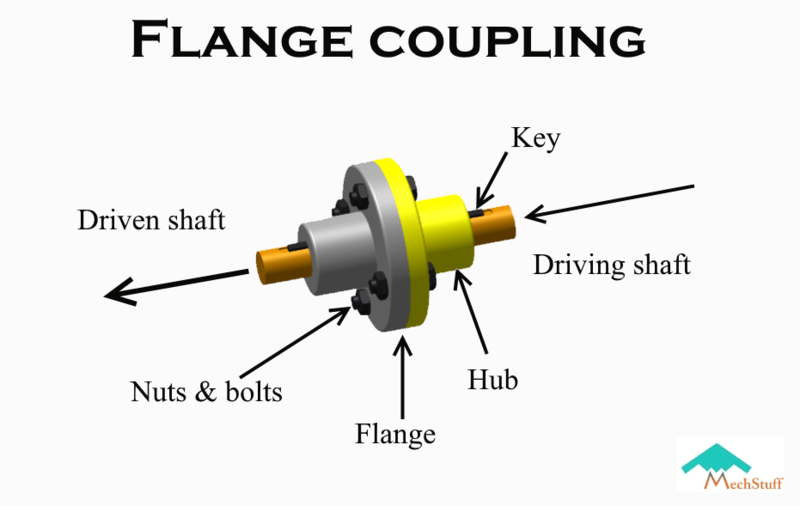 Flange couplings are used for medium & heavy-duty industrial applications. Animation of the 2 most flexible coupling at the end of the article! You could say that this coupling is an upgraded version of flange coupling. The only difference between them is the usage of rubber bushings. Slightly thick rubber bushings are designed so that the studs or bolts perfectly fit inside it and bushing fits perfectly inside the holes provided. The major advantage of using this coupling is that it can be used for slightly misaligned shafts. The rubber bushings add a certain amount of flexibility to the coupling which also helps to absorb shocks and vibrations. 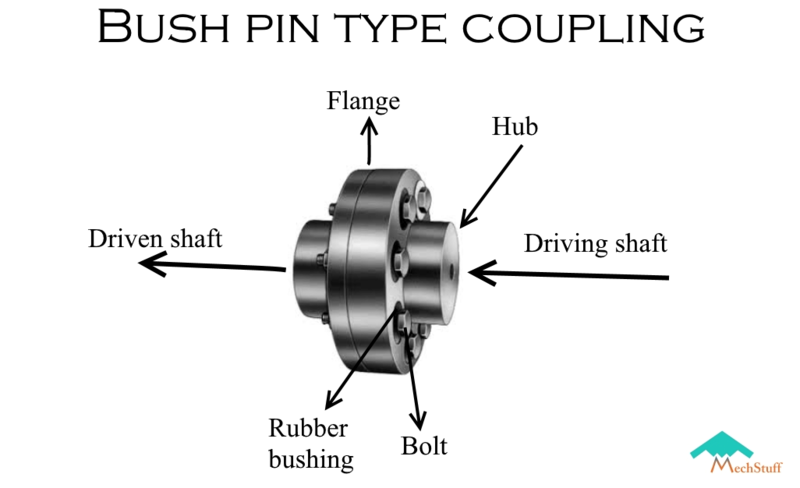 Bush pin type couplings are used where there is a little amount of angular, parallel or axial misalignment. They are used in medium duty applications in electric motors & machines. The gear coupling is another modified version of the flange coupling. In gear coupling, the flange and hub are different parts assembled together instead of a single part as in flange coupling. The hubs are externally splined but they are so thick and deep that you can regard them as gear teeth. Also the flanges have internal teeth. The gear ratio is 1:1 and are meshed together. The single joint gear couplings are limited to lower angular misalignments. 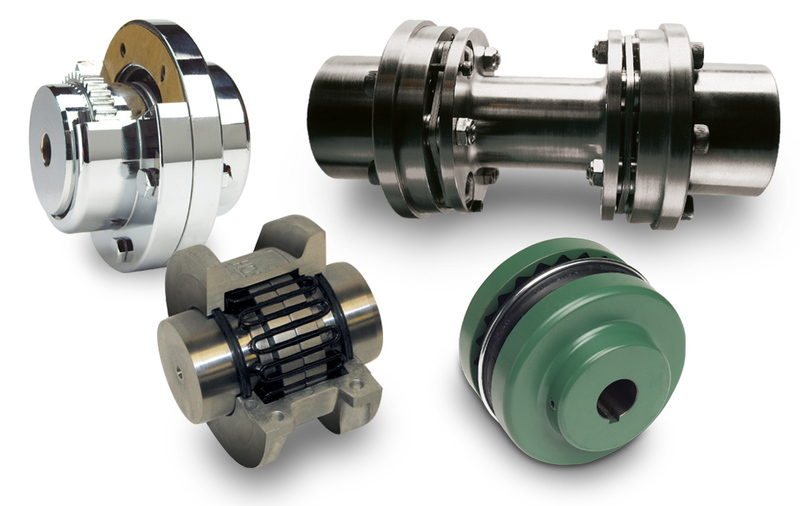 Gear couplings are used for heavy-duty applications where requirement of torque transmission is higher. 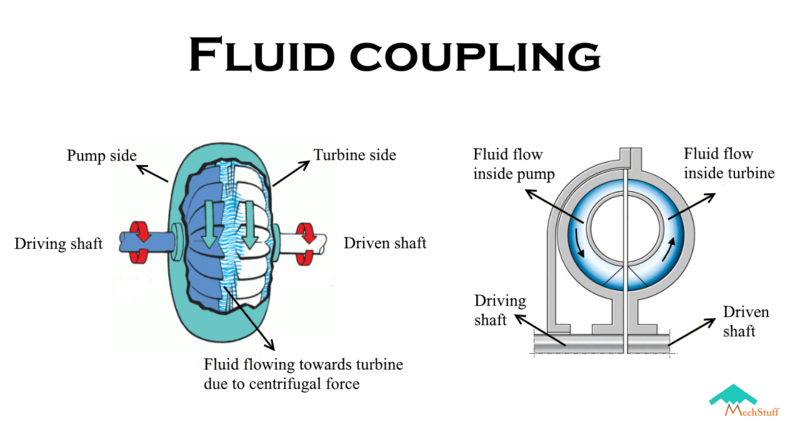 Fluid coupling consists of 2 parts – a pump & a turbine. Both of these have blades mounted inside at a certain angle. The pump is mounted on the end of driver shaft while the turbine on the driven shaft. The fluid enters into the pump through its centre and when the driver shaft rotates, due to centrifugal force it is pushed outwards. The casing is such that it diverts the motion of fluid into the turbine and the turbine blades along with turbine starts rotating. This way the pump and the turbine both make a coupling. When an extra part called a reactor is introduced between the pump and the turbine, surprisingly the device becomes a torque converter which is an alternative to manual clutch in automatic transmission systems in cars ! It is widely used in marine and industrial applications where controlled start-up of the power transmission is very essential. This is sooo cool! The Rzeppa joint/coupling also called as CV coupling(constant velocity) is a type of coupling in which the driven shaft rotates at the same speed as the driver one. Also it is able to transmit power through variable angles. The joint is protected by applying grease on the it and is covered by rubber boots. Rzeppa joint is used in vehicles with independent rear suspension. In India, if you notice, you can see these joints near the rear wheels of rickshaws and tuk-tuks or chhakdas. As the name suggests, this type of coupling can be used anywhere. The universal joint can transmit power even at high parallel or angular misalignments. It consists of a pair of hinges close together perpendicular to each other connected by cross shafts. Unlike Rzeppa joint, the universal joint is not a constant velocity joint. This means that rpm of driver and driven shaft won’t be same at every angle. Universal joints are used in machines where there are space restrictions or high flexibility is needed. It was great experience about your article. It gained lot important things and knowledge in very simple language.